Conscientious parents still urge their children to become doctors, lawyers, and CEOs, but in the 21st century, students heading into college are just as likely to be advised to become scientists. In fact, in the last two decades, the number of STEM undergraduates has gone up quickly and decisively, as reported by Inside Higher Ed, while students in the humanities have gradually gone down. There’s good reason for it, too – good financial reasons. 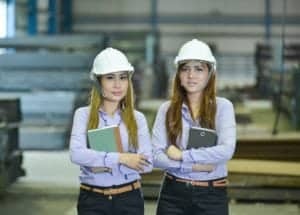 According to the Bureau of Labor Statistics, after jobs in the medical profession, all of the highest-paying occupations in the US have “engineering” in the name. The job market for STEM careers is incredibly reliable, and despite growth in science majors, there are still not as many qualified professionals to fill all of the needs in education and industry. For prospective students, The College Consensus has pulled together a massive set of data to show the full picture of higher education and career development, from reputable college rankings to job market surveys. We’ve put together this straightforward guide to the basics of Science and Engineering education and careers as a convenient entry point to your research. All of these give graduates access to the highest-paid careers in the world, and all have a strong job market showing, since they are extremely demanding and technical majors that very few students dare tackle in the first place. 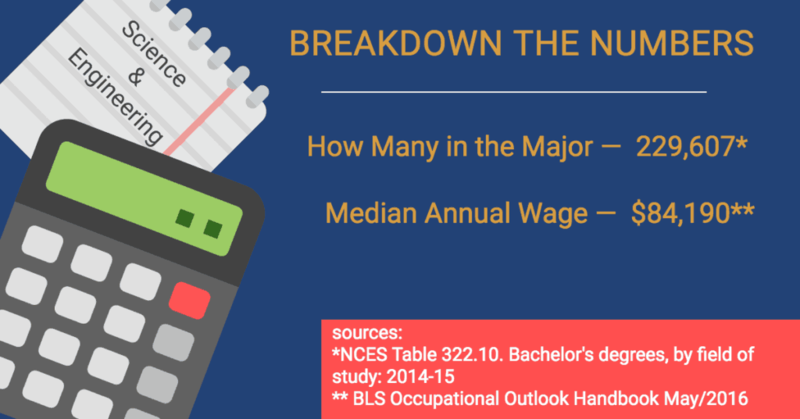 All of the STEM disciplines have a wide range of uses, from education to industry, while mathematics and statistics are among the most in-demand majors in every sector, precisely because so many fields depend on numbers – not just finance and accounting. Are There Any Online Options for Studying Science & Engineering? Obviously, STEM is a highly hands-on, demanding field, and a strong education in a STEM field often means needing access to laboratory facilities, specialized tools, and one-on-one guidance. For that reason, online undergraduate programs in many STEM areas are rare; Mathematics, for instance, may be learned fairly effectively online, but Engineering or Biochemistry may not be such good choices. However, beyond the bachelor’s level, there are many online master’s and doctorate degree programs in all kinds of STEM areas, from astronomy to zoology. Many engineering master’s degrees can even be earned online, with the assumption that online STEM students already have the hands-on experience of a bachelor’s degree, and are already working professionally in the field. STEM management and administrative degrees, such as Engineering Management, are also commonly available in an online format, since these are less technical specializations. Are There Complimentary Majors or Fields to Science & Engineering? Other fields may have a strong all-around usefulness, like English or Communications, which can help develop the writing and speaking skills that (to be brutally frank) many experts in the sciences lack. Being able to represent your field well in the media, industry conferences, and private investors’ meetings can lead to advancement to managerial and administrative positions, as well as bringing the perennial pursuit of government and private grant funding within your reach. Even if you’re never a famous public intellectual like Neil Degrasse Tyson or Carl Sagan, writing talent has its place in STEM. One quality that has made STEM degrees an attractive career path is the fact that, unlike many other professional careers, STEM graduates can enter the workforce with only a bachelor’s degree and make the kind of money other professions need a master’s degree to attain. However, as in other industries, managerial and administrative positions often require a master’s degree to progress, especially in engineering and other applied sciences. Many scientists and engineers begin their career with their bachelor’s degrees, then find themselves pursuing a graduate degree online or in evening or weekend programs to qualify for advancement and promotion. STEM accounts for some of the fastest-growing jobs in the nation, according to the BLS, and not just in the obvious areas like computers and technology; alternative energy, cartographers, and genetic counselors are among the careers with a job growth rate of over 25% between 2014 and 2024. In short, every sector is open to STEM graduates. While business graduates can’t work in a lab, biochemistry majors can work in business; while political science majors can’t design a rocket, rocket scientists can work in government (and more probably should); English majors will never sequence DNA, but geneticists can write books that change the world. One characteristic very particular to scientists is a healthy mix of skepticism and openness, which allows scientists to accept and try new ideas, but to also keep from getting caught up in unreasonable beliefs or enthusiasms. Contrary to the old stereotype of the scientist as a geeky, introverted loner who can’t work with others, studies have found that the most successful scientists have good communication skills, work well in teams, and balance introvert and extrovert characteristics. Much work in the sciences today is done in collaborative or team environments, making such traits pretty important.